When Mitchell pitched the idea at the 2012 South By Southwest (SXSW) Festival, Austin Chronicle staff writer Richard Whittaker, who also served as a panel judge at SXSW, broke the story and the word spread like wildfire. “The minute the thing got out, I think Blabbermouth picked it up, and then all the metal sites picked it up, and all the horror sites. Also, every band and another was calling us up, and of course, Philip knows 95 percent of all the metal bands out there — they know him. I mean, he’s buddies with some of these people. He could literally just go, ‘Hey, I’ll find Charlie Benante from Anthrax; here, you want to talk to him? Okay, sure. Here’s Kerry King from Slayer, see what he’s up to,” Mitchell says. Since the festival idea went public, Anselmo and Mitchell have been seeking the right type of sponsors to make it possible on a larger scale than initially envisioned. Alongside the plethora of films and bands, there will also be horror and heavy metal vendors, food trailers, zombie makeovers and a special visit from Matt Valentine and Michael Faust, makeup masters and former contestants on the reality TV show FACE/OFF. Not content to recycle the same handful of horror films that bigger festivals like SXSW and Sundance will be screening — they already have plenty of exposure and distribution as it is — Mitchell and Anselmo say they want to showcase filmmakers from different backgrounds, whose movies Mitchell believes desrve more coverage. “A lot of the ones that we picked are way better than the ones that I saw at the film festival, and probably will never get distribution. Maybe now with Housecore they will, or maybe other people take notice of some of these flicks, and know that these are just some incredible, low-budget, indie, well-written, intelligent flicks that really deserve an audience,” Mitchell explains. As for the music portion of the event, the festival will feature performances from bands that embody the marriage of horror and heavy metal, such as the Chicago-based band First Jason (www.FirstJason.com). Fronted by Ari Lehman, who played a young Jason Voorhees in the first installment of the legendary “Friday the 13th” franchise, the self-proclaimed “punk-metal-horror-comedy duo” pays homage to the archetypal slasher film. With songs, such as “Jason Never Dies!” and “Machete Is My Friend,” off of their debut album, “Jason Is Watching!,” the group firmly establishes their identity with an unique instrument — Lehman’s electric machete. “I do play the world’s only heavy metal keytar, which is the electric machete, which is basically an analog synth which has been duct-taped to a giant machete, with an LED Jason mask in the blade, and I play it through a Gallien-Krueger, big bass amp with 4x10 [speakers]. It’s just about as metal as you can get,” the child-star-turned-metal-monster proudly declares. 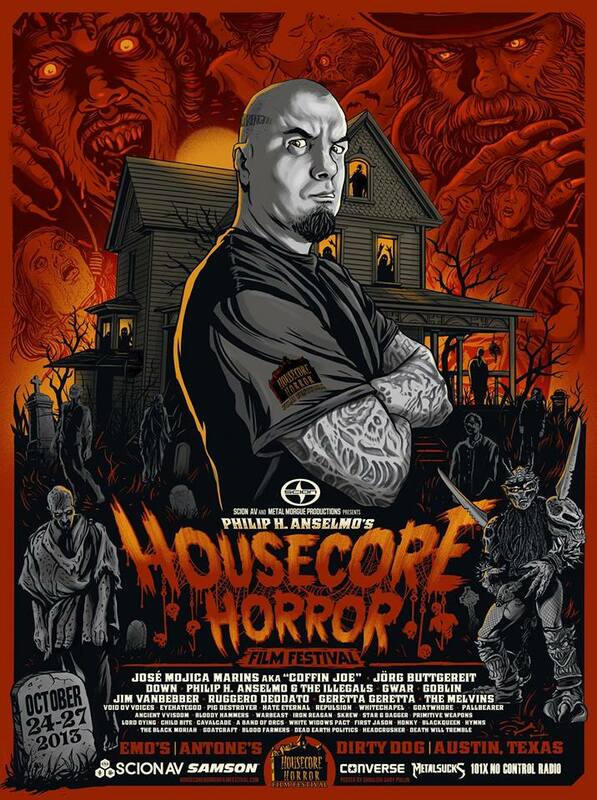 For Mitchell, the Housecore Horror Film Festival is simply about him and Anselmo sharing their passions with the world. “It’s just a bigger stage for me and Phil to sit there and watch horror films together. It went from his house to hanging out with 2,000 friends and fans,” he says.